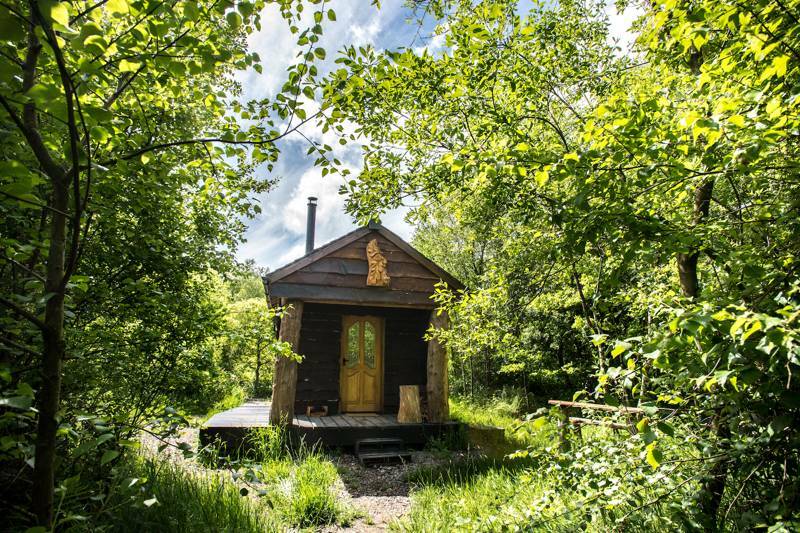 'Have a great time in the woods' in this cosy off-grid Devon cabin. With a motto like 'Have a Great Time in the Woods', we thought the intriguingly named Bulworthy Project sounded like our kind of place, and it most certainly is – a glorious woodland spot that is the home of Anna and Pete Grugeon, who came to live in Henson's Wood a decade ago after years spent travelling in their campervan. 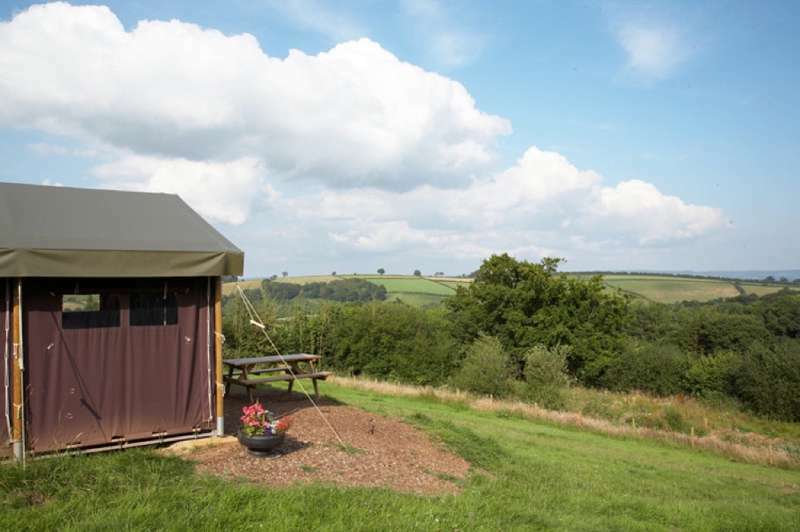 They built their own eco-friendly home in the trees here, and now own and run this unspoilt stretch of Devon forest as active woodland as a place to stay and a venue for courses and events and all sorts of countryside activities. Pete and Anna are charcoal-makers by trade, and manage the woodland for charcoal, which they sell locally; they also run charcoal- and bow-making courses and host open days and evenings when the general public come here to eat, make merry and get that little bit closer to nature. Anna and Pete rent out a cosy woodland cabin set in a super-secluded woodland clearing as a perfect off-grid romantic getaway, a cosy shack almost entirely handcrafted from wood – much of it using the trees that surround, from naturally fallen oaks to locally coppiced cherries. Electricity is provided by nearby solar panels which powers the wifi, USB sockets and an electric cool box (but nothing else). Despite that, the cabin is as cosy as can be, with a bed and en-suite bathroom, an ingeniously designed kitchenette and an intimate living space warmed by its own wood-burner, which also heats the water. The cabin also has its own very comfy hammock and a private campfire and barbecue outside, and naturally you will find a big bag of charcoal waiting for you when you arrive. There are footpaths through the woods, which are around 12 acres in all, but The Bulworthy Project doesn't only give you your own patch of forest to explore. It's also extremely well positioned in the centre of Devon, and the countryside around is a magnet for walkers, cyclists and lovers of the Great Outdoors. There is so much to explore here – nearby Tiverton is an unspoilt and rather beguiling small town set on the Great Western Canal, the multiple delights of Exmoor are just a few miles to the north (the Two Moors long-distance footpath from Exmoor to Dartmoor runs nearby), and there's also a decent array of places to eat and drink within easy distance. The excellent local pub, the Stag Inn in Rackenford (a 15-minute walk away), claims to be one of the oldest in the county and serves good pub food, as does the nearby Swan in Bampton, while the renowned (and Michelin starred) Mason's Arms in Knowstone, a ten-minute drive away, draws hungry punters from miles around. So there it is: your perfect off-grid Devon woodland escape – off the beaten track, but not too far off it...! A cosy two-person shack with one double bed – the perfect romantic retreat. Two night stays £200–£240, depending on season, 7 nights from £550 to £690. Two nights' minimum. Leave the M5 and junction 27 and head towards Barnstaple on the A361. The Bulworthy Project is about 7 miles from Tiverton and 15 miles from South Molton. There are 3 turnings marked 'Rackenford' off the A361; take the second one and at the end of the road turn left. There's a sign saying 'Henson's Wood' a little way down on the left.